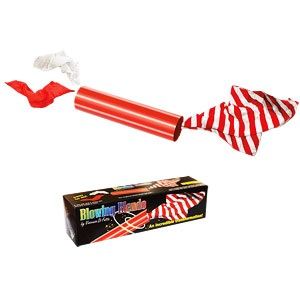 It’s all simple blowing fun… That turns into a whole lot of blendo magic! will magically fly out. The silks will have amazingly blended together! At the end the tube is shown empty. diameter of 1.25 inches (3cm). The small silks measure 7.5 inches (19cm) on each side. The blendo silk measures 13.25 inches (34cm). You get the silks and secret metal tubes and gimmick. Super easy to do… Anyone, any age can do it!